Madison, Wisconsin is known as a don&apos;t-miss destination because of its amazing attractions. Whether you&apos;re here to visit the Capitol building, visit the UW-Madison campus or spend time on our lakes, we have a never-ending list of things to do. Below is a searchable database of attractions segmented by category, location or keyword. Once your search is compiled, click to discover details about each. Another great way to inspire your next visit is to read our sample itineraries! We have more than 20 different adventures, from the food lovers in search of a Fish Fry, to outdoor enthusiasts exploring Madison&apos;s trails and lakes. 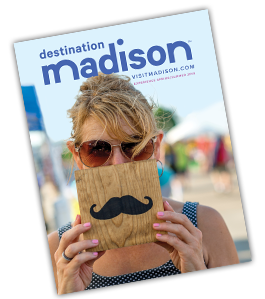 Take your Madison experience to a new level with Essential Madison Experiences. These hands-on adventures are your ticket to unforgettable experiences you can only find in Madison.